Sincerely sorry for not posting an update last week. I was, on Thursday, coming back from Las Vegas, on the red eye, via Chicago. Fear not, I was thinking of you, and knitting. My lesson from knitting at O’Hare airport from 5-8am after staying up all night? Well, keep it simple, or just don’t do it at all. I highly recommend against attempting ‘a plaited cable pattern that resembles an oscillating line’ while drinking a latte and pretending you are not tired. Even if it means you can’t continue until you are home, don’t do it. When I realized I had twisted the wrong way, I was well into the next cable, an hour and a half (plus two days and some sleep) later on a Saturday afternoon. Since I have the universe on my side, the incorrect twist isn’t very noticeable. Plus, it’s exactly in the centre of the wrap, almost like on purpose. I’m a quilter at heart, as you may know, so I believe in the Amish quilting myth of ‘one deliberate flaw’. I believe that a single flaw should accompany every hand-crafted item. It shows that not only was the item made by hand, but also with love. Most of the time, the flaw comes after a sleepless night, or pattern reading error (not on purpose). In my opinion that only reinforces the fact that when we are passionate about something, we sometimes work into the wee hours, past the point of exhaustion, out of love. 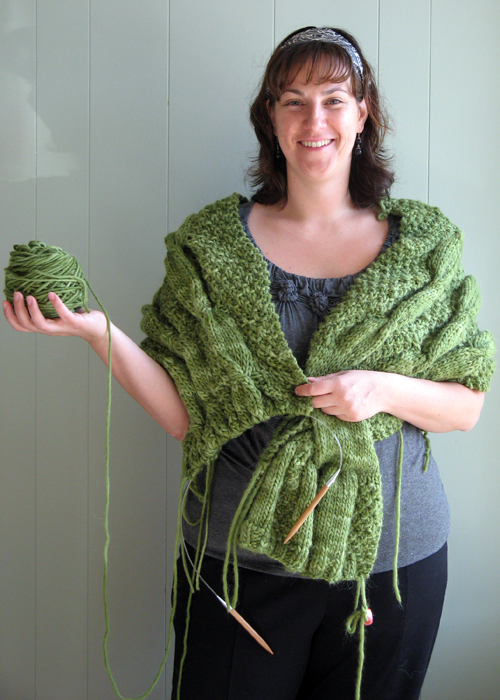 I have fallen in love with my green wrap, and will wear it with pride at TNNA in June. I’m certain it will be too warm for wool, but that won’t stop me.